← How to Create Division & Politicize EVERYTHING!!! Hey all, it’s your favorite libertarian artist putting pencil to paper, and working around the clock to create even more awesome libertarian art for you to laugh at, share on social media with all your friends and neighbors, or angrily punch your fist through your ipad screen. It’s totally up to you, cause that’s just how free we are around here. So I thought an image of an old style Communist like Karl Marx rubbing his cheeks, getting all those warm and fuzzy collectivist feels over sending dissidents to work camps and regulating all of society out the wazzoo would be perfect. And just for kicks, I threw in a couple other different designs and slogans concerning leftist academia and statism in general. Do you have any ideas? Let me know! Feedback is always appreciated, and encouraged. Also, be sure to check out our graphics page for even MORE of our exclusive libertarian cartoons, illustrations, funny memes and infographics! Because let’s face it…sometimes the best thing you can do is laugh! 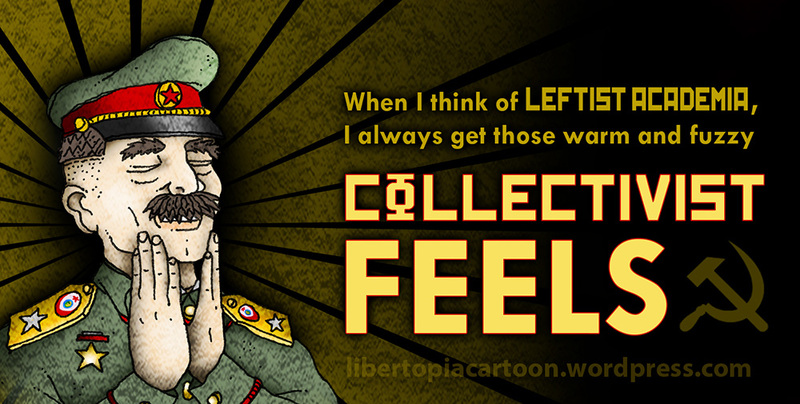 This entry was posted in Uncategorized and tagged Borg, collectivist feels, collectivist mentality, Commies, Communist, funny memes, government school, Illustrations, Karl Mark, leftist academia, Libertarian Art, libertarian artist, libertarian cartoons, public school, star trek, statism, western society, worship the state. Bookmark the permalink.